Based on the Libra October 2019 horoscope, your emotional success will be the main thing this year. Your career ambitions and financial status will have to wait for another period. The Libra sun sign will be interested in being happy this month more than anything else. The Libra personality is highly aggressive and passionate. Independence also runs in your body. You can achieve things on your own without the help of your friends and family. The 2019 Libra astrology predicts that your attitude towards your love relationships will change. You will be in the mood at all times to make your spouse or partner happy and joyous. You and your spouse will enjoy a harmonious and equal union. Libra zodiac singles will get love easily in social gatherings and entertainment centers. Libra pregnancy at this time is assured because of the happiness enjoyed by both you and your spouse. The Libra zodiac sign predictions foretell that you are likely to engage in conflicts with the elders since you are controlled by a mind of your own. But it is upon you to ensure that you do not get worked up quickly to avoid being cursed by those who are senior to you. You will have to ensure that the Libra children are not caught in between the arguments that will be ensuing between you and the elders. According to the October horoscope 2019; your health will be superb this month. Taking balanced diets and playing with your children will aid in maintaining your physical health. These activities will also improve your well-being intensely. 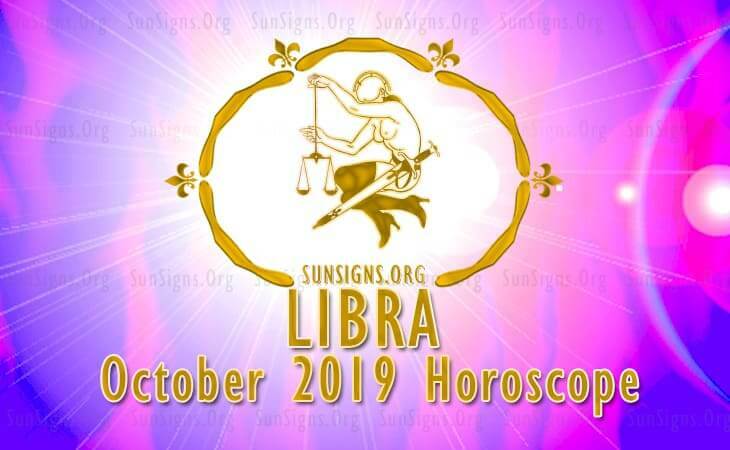 As per the Libra October horoscope 2019, the role you play in your profession will be that of a supportive nature. The career growth of others will be your number one priority. Your happiness will also influence your career growth. The monthly 2019 horoscope predictions show that monetary growth will be your portion this month. You will not have to worry about financial issues because the stars are rightly aligned to bless you in this sector. The Libra star sign will get assistance from others when it comes to financing projects. The horoscope 2019 predicts that this month will see you not do well in your studies. The stars are not rightly aligned to bless you in this sector. Libra, you will have to put your educational pursuits on hold until a time when the stars will be favorable to you. Trips you have planned abroad should be canceled so that you do not get disappointed when your educational pursuits fail to take shape. According to the Libra October 2019 horoscope, this is a favorable month for your travel pursuits. You will amass great gains from your travels since the stars are aligned to favor you. Those traveling abroad will be glad that they did so because success will follow them throughout the year. Refer to Chinese Horoscope 2019.